Tokyo-chutei-iki, the 10-man baritone sax ensemble from Japan is, in the best possible way, a very well-oiled machine. Formed in 2000 by Akira Mizutani, 'Tokyo Bass Frequency' (or 'Tokyo mid-low frequency band limits', as he wrote on the band's site), performs without any other instruments, apart from their voices. They have travelled the world and were favourites of Charlie Gillett, to whose memory they paid tribute on their 2011 album, The Last Baritonik. 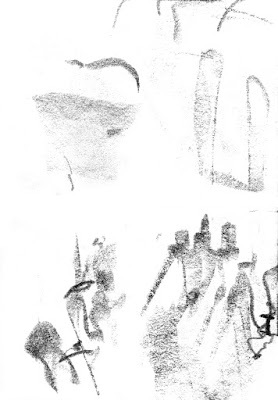 Returning to St Johns, where they had appeared four years earlier, each saxophonist was dressed in black, expressing their individual personalities through sartorial selections, with headgear ranging from worker's cap to rounded stovepipe, pork-pies, a wide brim fedora, off-beat beanies and a fluffy, felted explosion. 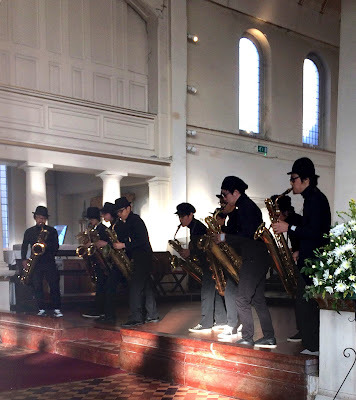 Emerging on to the stage area within the formidable architecture of St John's, to pick up their saxes neatly arrayed on the tiled floor of the chancel, they did a swift tune up and then were straight into Mituzani's tightly-arranged repertoire. This was billed as a free, lunchtime, open rehearsal, ahead of their evening show and two nights at Ronnie's, but it was anything but a warm-up. They delivered two lively 40-minute sets, with touches of light wit all the way through an energetic and polished performance, which drew in a large crowd who clearly enjoyed every minute. There are many flavours to the group's tight but loose, united front. The syncopated undertows pumping away to anchor the melodies called to mind the early twentieth century compositions of Les Six. With Mizutani conducting with metronomic arm gestures from his place within the group, they covered pure pop, the broad brush of world music and made forays in to jazz, which came through strongest when soloists took centre stage, improvising vigorously. Assured and well-rehearsed, with the crafted, interwoven arrangements branded in to their make-up, the batting of elephantine bass lines and descriptive melody came as second nature to these baritone virtuosi. Which gave them room to add bursts of synchronised pogo-ing, the odd leap, and sorties deep in to the audience, stopping off to serenade a babe in arms as they did their rounds. To preface their encore they sang from song sheets with each singer's photograph on the covers facing the audience - a lovely touch of graphic wit on which to close.